In the book "Albemarle County in Virginia" by Edgar Woods (Bridgewater, VA: Bookman, 1932), the father of Col. Robert Lewis is said to be another Robert Lewis who was a Welshman and an officer in the British army who arrived in America in 1635. 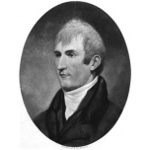 This account was repeated in Stephen Ambrose's book "Undaunted Courage: Meriwether Lewis, Thomas Jefferson, and the Opening of the American West" (New York: Simon and Schuster, 1996) using Edgar Woods' book as the source. Most other sources, including some older than Woods's book and others newer than Ambrose's book, state that Colonel John Lewis was Robert Lewis's father. 1 NEHGS NEXUS: New England Across the United States, 1987, Vol. 4, p. 26, New England Historic Genealogical Society (Online Database). 2 Crawford, Robert Leighton, Laurus Crawfurdiana: Memorials of that Branch of the Crawford Family Which Comprises the Descendants of John . . ., New York: Edward O. Jenkins, Printer (1883), 18, Ancestry.com (Online Database). 3 Davis, Lottie Wright, Records of Lewis, Meriwether and Kindred Families; Genealogical Records of Minor, Davis, . . ., Columbia, MO: Artcraft Press (1951), 18, 50, 159. 4 McAllister, John Meriwether, ed. and Lura Boulton Tandy, Genealogies of the Lewis and Kindred Families, Columbia, Missouri: E. W. Stephens Publishing Company (1906), 24-25, 40, Ancestry.com (Online Database). 5 Stephens, Lucinda Frances Hammack, Crawford Genealogy: "sine labe nota", Macon, Ga: J. W. Burke Company (1936), 10, Hathi Trust Digital Library. 6 Tyler, Lyon G., ed., William and Mary College Quarterly Historical Magazine, Vol. 11, Richmond, VA: Whittet & Shepperson (1903), 43.